Nowadays it is difficult to find out the apartments/villa for sale or rent because of lacking stylization in interaction with the people next to us so our Landwatch Clone Script permits you to take this opportunity as a business to run in the market to print your own fashion of manner in the ever-greenstrong real estate business which will be the trendy approach to reach the peak within the earlier short period of time to the large area of customers. 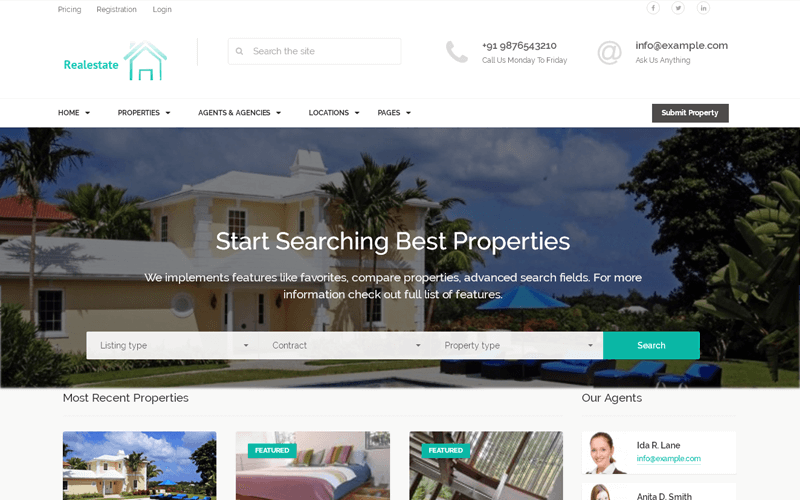 We integrated a high-end Apartmentguide Clone Script into your website and showcase the properties for sale and rent and acts as a tool to manage with more audience of buyers and renters. Initially user can register and also choose their own membership on their own choice for the feature experience. Also user can list their own property for sale or rent and manage their listing like property details, add multiple images, publish classified ads online and also can mention the furnished details to make more money in their profile’s dashboard. In our ReadymadeRealestate Script, there is lots of advanced option to the search for the users alike can search by using the Google map, property ID, property name and property location. For more convenient, we embed a option of comparable between the properties that means you can select the properties which you selected to buy or rent and click the compare, it takes you to know the clarification of whole the details between those compared property. After the selection of property, user can contact the agency or agent by its location through Google map or by contact number. Whenever based on the need of user can update the membership plan and pay by the default payment gateway as PayPal. Readymade Landwatch Script latest approach in providing the facilities to handle through the admin panel. Admin panel uncovers the liability to add or delete the property listing. It is light hard process to management to the admin properties posted, communication form analyze, caring the every single page in the script, Media management and CMS settings in a efficient conduct.Our Open sourceApartmentguide Script has integrated with collective revenue modules return you an excellent return for your investment Premium Membership, Banner advertisement, Premium Listing for the properties. By the SEO friendly design w used in this script will help you to be in top always on the search engine for the positive approach with the users. Also we are pleased to clarify all of your queries at anytime and for better access of the Real Estate Agency Script we are offering free technical support for 1 year to make you in comfort zone whenever you need. Excellent script, solid infrastructure, and great customer support. These guys are worth 5 stars alone, based on their support. They answer quickly and fix whatever problem you have! The script is also easy to work with, and works just as promised! A must-buy!